Alex Hughes — Bonsall, CA …Bonsall is a very small community before Fallbrook and can be seen where I am writing this. Apart from the shopping center with McDonald’s, there is another with the AMC Classic Theater. That is where I found myself in front of Daniel’s Market. It was not the usual Mexican market but rather an American one. There was quite a colorful sign out front along with newspaper stands with local papers such as the Village News. I noticed the Boy Scouts selling their popcorn to passerbys. Once I grabbed a cart, I entered through the side door which was small and noticed how big the store was. It was not the hole in the wall with cramped aisles but was lit up with the linoleum floors. There was also a large American flag boasting with patriotism. I enjoyed the sight and went through packaged goods and cleaning supplies. The products were interesting because there were brands that I had seen at the Mexican markets such as Springfield and even Kroger. Overall, the packaged goods were higher priced than what I buy at Albertsons. However, I did find some inexpensive canned goods from Special Value such as corn and Springfield Mustard. There were local products from the immediate area such as in Riverside County along with hummus from Vista. I had no idea that there was a hummus brand where I lived. I also brought some tasty turkey jerky from Country Archer that is located in San Bernardino. The produce section was fairly small compared with other grocery stores, but I did manage to pick up some cucumbers which my grandma pickles. The checkout lines where near where the dried fruits and nuts were. I did manage to take a peek but saved that for Frazier Farms. 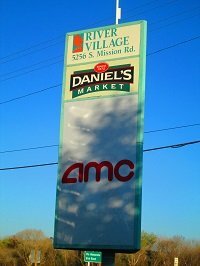 I was curious to know if Daniel’s Market was part of a chain, and I asked the checkout clerk. It seems that it is the only location and was once a part of Kroger. 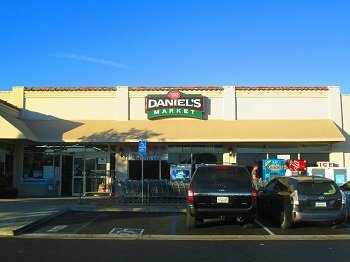 My experience allowed me to expand beyond the usual chain stores such as Vons, Albertsons and Stater Brothers and enjoy what a small American market looks like.